A couple of days ago I took this online training “Nature-Based Learning and Play for Autistic and Special Needs Children” presented by: Naomi Sachs – www.NaomiSachsDesign.com & Tara Vincenta www.artemisLA.com. It was a great and very useful training. In Denmark the focus on the positive benefits of children experiencing the natural world has resulted in a lot of “Nature Kindergardens” and nature-based playgrounds in the forests – however finding an online training focusing on how nature-based learning and play can help children with autism and related disorders was new to me. I found the online training via the Therapeutic Landscapes Network blog. They introduced the course like this: Since Richard Louv began his No Child Left Inside campaign, we have seen a wonderful groundswell around the importance of children experiencing the natural world. And at the same time, sadly, we continue to see an alarming rise in children with autism and other related disorders. According to the Centers for Disease Control, autism now affects 1 in every 110 American children. This new number is a staggering 57% increase from 2002-2006. Clearly, we need more research on prevention and treatment options, but we also need more ways to help those children (and their families) on the “autism spectrum” who are coping on a daily basis. One way that we can help is by designing environments that support children on the spectrum, including outdoor play and learning spaces. That’s why Tara Vincenta – Principal at Artemis Landscape Architects and creator of the SOL (Sequential Outdoor Learning) Environment – and I were thrilled when KaBOOM! approached us about doing an online training on this very subject. We’ve had a great time collaborating and are happy to announce that the training is now available on the KaBOOM! website, and will soon be up on the SOL Environment and Therapeutic Landscapes Network websites as well. Join landscape architects Naomi Sachs, Director of the Therapeutic Landscapes Network and Tara Vincenta, creator of SOL (Sequential Outdoor Learning) Environment as they explore research and design considerations for creating outdoor, nature-based play and learning environments for autistic and special needs children. Many of the challenges faced by autistic children are shared with a broader community of special needs children, including motor, neuromuscular, cognitive, sensory and communication issues, and visual and auditory impairment. Sachs and Vincenta will share ideas for creating outdoor spaces that allow children to play at their own comfort level, overcoming common challenges in a safe, FUN, nature-based environment that is equally engaging for any child. Go to KaBOOM’s Hot Topics in Play page to access the training. Afterwards I was wondering who is working writhing this field here in Denmark and Scandinavia. 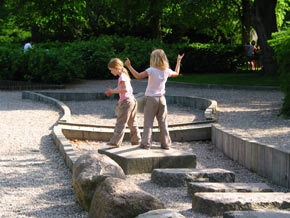 I found the website of Helle Nebelong a Danish landscape architect who focus on the design of healthy, inspiring natural spaces for children, the young disabled as well as elderly and senior citizens (I have borrowed the image from her website). It looks very interesting… you are most welcome to pop me a comment if you know about other people working within the area.